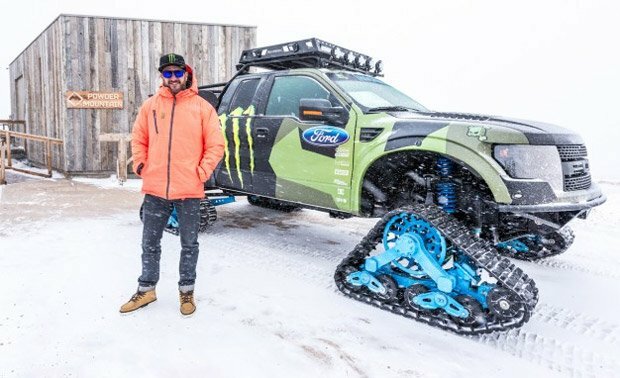 Back in January, Ken Block gave us the a look at his ultimate snow vehicle in the form of a Ford Raptor truck with tank treads instead of wheels at each corner. The truck is called the RaptorTRAX and it is awesome. More recently, Ken climbed behind the wheel of that RaptorTRAX truck and took it up to the mountains. Block drove the beast to Utah’s Powder Mountain and proceeded to beat on the awesome truck in the snow. This may well be the last time Block is behind the wheel of this Raptor, he is already working on version 2.0 of the RaptorTRAX vehicle with his team.